Now readers around the world can view the manuscripts of Leonardo da Vinci’s Codex Arundel in high definition on iPad as the British Library launches its ‘e-book treasures’ series. 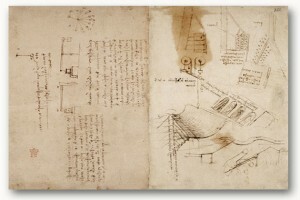 The Italian manuscript written in Da Vinci’s characteristic ‘mirror writing’ – left-handed and moving from right to left – is a collection of notes, drawings and short treatises on subjects ranging from the physical properties of water to descriptions of a prehistoric sea monster. The e-books feature page-turning technology to recreate the experience of holding the manuscripts and will enable users to access in-depth detail about the works they are viewing, including written, video and audio interpretations. Mercator’s Atlas is another precious manuscript available to download alongside Da Vinci’s Arundel Codex. The volume was painstakingly compiled by hand in the 16th century by Flemish mapmaker Gerardus Mercator, the man believed to have coined the term ‘atlas’ for a collection of maps. “Mercator was one of the best known map makers and the atlas is the most important surviving collection of his hand drawn maps,” Peter Barber, head of cartographic and topographic material at the British Library, told Reuters. “It contains work from the 1564 hand drawn map of Great Britain, hailed as the first modern map of the island. The atlas was put together by hand to create something quite remarkable,” he added. The next works to feature on the iPad in HD will be Lewis Carroll’s Alice’s Adventures Under Ground – the original version of Alice’s Adventures in Wonderland – musical manuscripts of Handel’s Messiah, and the Tyndale Bible, the first English language bible to appear in print. The British Library expects 75 titles to become available over the next two years, either as entire texts or sections of highlights of the library’s most precious manuscripts.